Finally the stars have aligned for me to try making some of the amazing food that we had on our Vietnam trip at home. For me, easily the best meal was the trip was the cha ca (pronounced cha ga) that we had in Hanoi at Cha Ca La Vong. 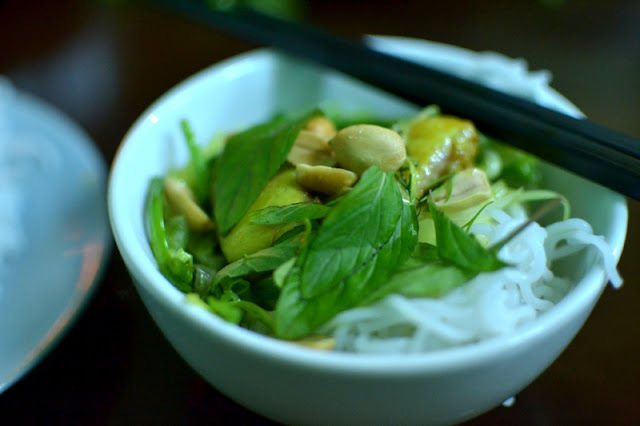 At the time, it was a "this is what I've been waiting for" moment to look down on this small dish in front of me filled with rice noodles, fresh herbs, sauteed fish, and fish sauce vinaigrette. Cha Ca La Vong has become an institution for Hanoi's famous do-it-yourself turmeric fried fish with dill and green onions, with a history that dates over a century old. In fact, in the Old Quarter where the restaurant is located, it resides at the address of 14 Cha Ca Street and the same restaurant has been at the same address since 1874. Not many restaurants can say they have a street named after them. The restaurant itself was a model of efficiency. The staff is bossy and curt, which has given them a lukewarm reputation in the form of online reviews, but they were more than happy to carefully show us how to prepare a dish (it is pretty overwhelming to sit down and have a half dozen dishes laid out in front of you with different stuff in each one). I did have one small complaint though: it was immediately obvious upon entry that they had one room for Vietnamese customers and another room for everyone else. Part of the charm of being in a place like that is seeing how people eat, how they interact, feeling immersed in this country over 8000 miles away from home. Instead I felt a little sectioned off like I wasn't cool enough to play with the big kids. But really, it was a small price to pay for this classic. It's also very easy to make at home, using ingredients that are generally easy to find, and cooking time is just a matter of minutes. Before we get started, here's a quick refresher photo from our trip. This was my reference material. I found several recipes online for cha ca but none of them seemed quite right, so I ended up taking bits and pieces from multiple to put this recipe together. I was so happy with how this turned out - aside from the fact that my Vietnamese cooking experience is slim to none, I feel like the flavors and ingredients nearly perfectly matched what we had at the real restaurant. Begin by making the marinade and preparing the fish. Cut your catfish into small 1-2" sections (think bite size) and place them in a dish. Mince the garlic finely - if you have a microplane grater, now is a great time to pull it out. You can get a nice garlic paste by grating the garlic with it. Add all of the marinade ingredients to the dish with the fish and mix well with your hands. Warning: you will have yellow hands for about 2 days after this if you don't wear gloves! Allow the fish to marinate in the refrigerator for as long as possible - up to overnight. Next up make the dipping sauce. Combine all ingredients except for fish sauce and mix or whisk until the sugar dissolves. Since fish sauce can be kind of strong, you can start adding it after the vinaigrette is mostly finished, and season to taste. You want the vinaigrette to be seasoned relatively strongly for this dish. I also added some salt to the vinaigrette just to my own taste - about ½ tsp. This vinaigrette will keep for a week or longer so store the leftovers for another use. Prep the dill and green onion by chopping into 2-3" long sections, discarding the root end of the green onions. Tear off the basil and cilantro leaves from their stems and plate them on their own. Ok back on task. At Cha Ca La Vong, this dish is served tableside on a standalone burner. You are given a bowl of dill and green onions and you add them to the frying fish yourself. I am not quite willing to go out and buy a bunch of sternos to serve this thing tableside, so instead, grab your best heat retaining skillet (cast iron!!) and bring it up to med-hi heat. Add a splash of canola oil and swirl it around. Toss in the fish and allow them to saute for about 3 minutes, until browned on one side. Flip each piece and allow to cook for about 1 minute more. Toss all of the dill and green onions on top and let them saute for about a minute. Start mixing the ingredients, allowing the greens to cook for about 3 minutes. Turn off the heat and bring the hot pan to the table and place on a pot holder or something similar. Your greens will continue to cook down at the table and you still get the sizzling platter ooh's and ahh's effect, like that guy who always orders fajitas at the mexican restaurant and gets that stupid grin on his face when they bring it out. "Yeah. That's mine. I ordered the loud entree." The final and fun step is plating. This is all do-it-yourself. Fill your bowl with the rice noodles, top with some dill and green onion and a piece or two of fish. Add some of the herbs and peanuts, and spoon vinaigrette over the whole thing. Cha Ca La Vong gives you small rice bowls, so you end up making 3 or 4 bowls over the course of the meal. It's a nice slow way of eating, it makes the experience more pleasurable and gives you time to talk to the people you are eating with instead of gorging yourself. Making this dish at home took me back to a country unlike any I've ever seen before. It's memories like these that really resonate with me and will last a lifetime, and food is such a big trigger for memories that I do not doubt that I will look back and think fondly of my trip every time I make this dish... which will be a lot. Because it was that good. I might try this by swapping out the fish with tofu (and the fish sauce with, well, something). Sounds good. Was Neurosis worth the trip to MDF for you? My buddy Allen was so spent after their set he had to go back to the hotel room to sleep it off...hah. yeah man it was good. they played a couple new songs that i didn't know but i think probably just seeing locust star and through silver in blood was pretty awesome. there was some weird pseudo juggalo mosh up front though. i was disappointed by that. the vinaigrette you could probably just leave the fish sauce out and use salt instead. maybe a drop of light soy sauce or something. it's pretty well flavored even without the fish sauce that you might be fine with just salt. I made the base of this dish with a tamirid fried soft shell crab instead of the fish. Everything was amazing! I think I'll stick to your traditional recipie next time top get a true feel of what it is supposed to taste like. Your blog is awesome. Just got thru all the entries this weekend. Good luck with the veggie grow. I'll be keeping an eye on this blog for sure. thanks man, i have been too busy to do much lately, i need to get back in the groove. i'm glad your substitute worked out, it sounds really good. fried softshell crab sounds pretty awesome all around.